The MCA Trust is excited to announce that we launched a Toothbrush Campaign at local East London & Essex hospitals. Research shows that chemo and radiotherapy treatment for head and neck related cancers has serious effects on teeth and mouths. Keeping the teeth and mouth healthy and clean can help reduce these symptoms and WE want to help. More details to follow, but if you would like to get behind this campaign, please contact us on our Facebook and Instagram pages or via our contact page. On the 3rd April 2018, members of the MCA Trust visited children on the Tropical Lagoon ward in Queen's Hospital, Romford, Essex, accompanied by Moana, Belle, Chase and Marshall of Paw Patrol (supplied by the fantastic Sue Ospreay’s Lightnin’ Drama Group in Rainham, Essex). We visited many children including those in the oncology clinic, where we handed over the MCA Toothbrush packs to promote good oral hygiene, especially to those undergoing treatment for head/neck related cancer. The Romford Recorder joined us while we were there, took photographs and have run a story on us! On the 5th April 2018 we visited Princess Alexandra Hospital, Harlow for day 2 of our Toothbrush Campaign and we visited the Children's Emergency Department, Dolphin Ward and oncology clinic where we handed out our toothbrush packs and saw the children alongside Chase and Marshall from Paw Patrol and Minnie Mouse! 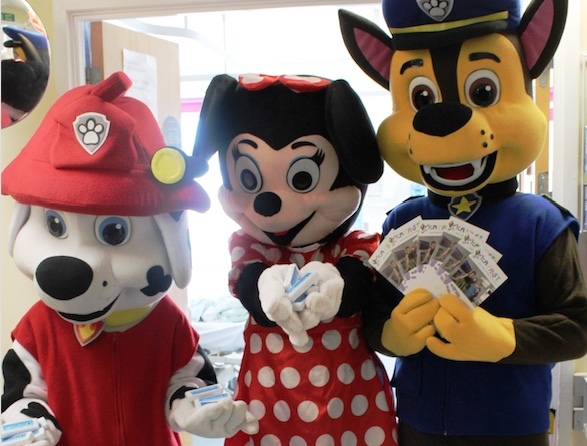 YOUNGSTERS know that the Paw Patrol are good at protecting the community; and when the kids’ favourites, plus special Disney VIP, Minnie Mouse, visited the Princess Alexandra Hospital in Harlow, they were keen to spread the message about protecting teeth and gums when you’re young. Some of the loveable characters were on hand to help the MCA Trust distribute free toothbrushes as part of its oral health campaign. The charity supports children living with cancer, and on Thursday it arranged a visit to the hospital’s weekly children’s oncology clinic to launch the MCA Fights Plaque Campaign. It handed out free MCA logo toothbrushes and toothpaste packs to children to highlight the fact that chemotherapy and radium can damage cells in the mouth leading to tooth decay and gum problems, and keeping teeth healthy and clean can help reduce symptoms.